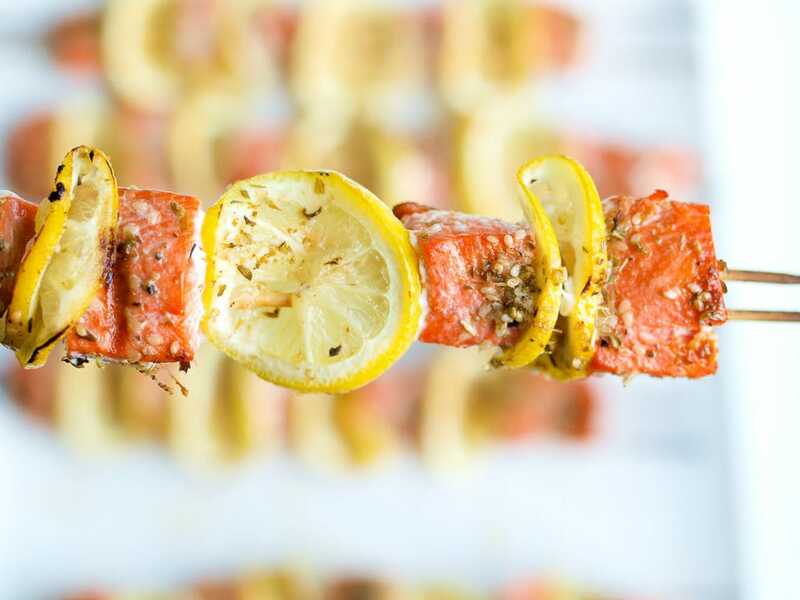 This Grilled Salmon Kabobs recipe is easy, flavorful, and a family favorite every time! What do you do when you get into a dinnertime rut? Recently I lost all my mojo for preparing and cooking dinner. Something about summertime weather and being outside that sapped my cooking energy. I just found myself not wanting to come inside to cook. I was uninspired to try anything new. So I lugged out my collection of old cooking magazines and perused the pages until I found my inspiration again. In a Bon Appétit from three years ago I found this recipe for salmon kabobs. It was the recipe that pulled me out of my rut, so I had to share it with you. I only made minor changes to the recipe. Instead of fresh oregano, I used dried. I’m sure fresh would be lovely, but using dried makes the whole thing less fussy. Unless, of course, you are growing fresh oregano in your garden. Then you should walk right out to your garden and get some for this recipe. Lucky you. I also omitted the red pepper flakes because my kids freak out if I use too much black pepper. Crushed red pepper flakes are out of the question at this house if the kids are going to eat it. Add those if you want a little heat. I also used more lemon and avocado oil instead of olive oil. I found that when I used two lemons I had to slice them too thinly and some fell apart when I tried to skewer them. When I used three, I could slice them a little thicker, which made them more sturdy and the lemon flavor stronger, which I liked. I used avocado oil because it’s a better oil to use for higher heat. Kids love food on a stick. Both kids were impressed with this presentation and it was easy! Meghan, Tim, and I all loved this recipe. Luke is still his 4-year-old self who is a bit more picky at dinnertime. Lately he’s eating the fruit and vegetable I offer and then saying he’s done. I’m not freaking out as much as I did when Meghan went through the same phase. I know now that phases are just that, phases, and they always come to an end. If you’re looking for an easy and healthy summertime grilling recipe, this one is for you. It’s pretty enough to serve to company, but easy enough for a quick weeknight dinner. Dinnertime rut, broken. Enjoy. This Grilled Salmon Kabobs recipe is easy, flavorful, and a family favorite every time! Mix together the oregano, sesame seeds, cumin, and salt in a small bowl, set aside. 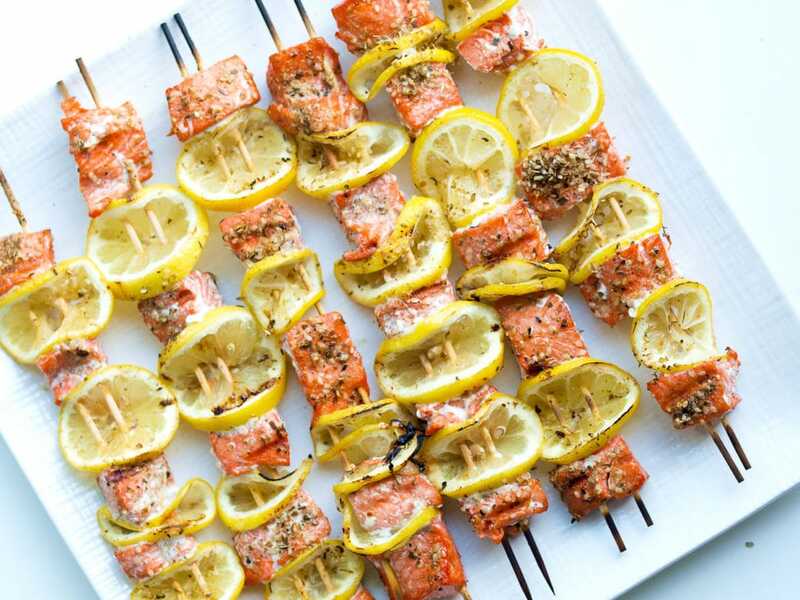 Beginning and ending with the salmon, thread the salmon and folded lemon slices onto two pairs of side-by-side skewers. 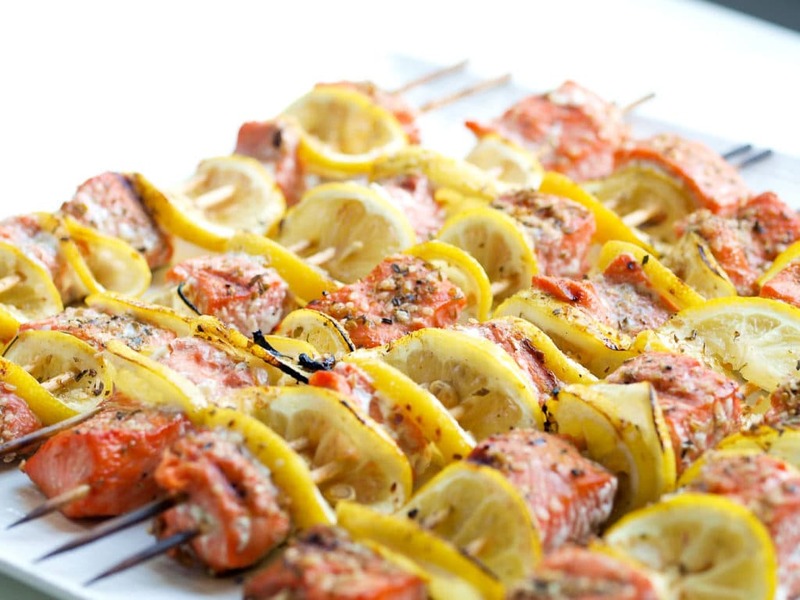 You will have 6-8 total skewers, depending on how close you put your salmon and folded lemon slices. Brush both sides of the skewers with oil and then sprinkle with the spice mixture. Grill, turning once or twice during the grilling time, 5-8 minutes, until the fish is opaque. This looks delicious. Do you have any tips for buying “safe” seafood? We don’t have a Whole Foods locally or else I would definitely go there as I understand they provide a lot of information about their sourcing. Also, is there a difference between extra virgin olive oil and olive oil? I’ve been reading a lot lately about cooking with oils and what heat level is best. Thanks, as always! No matter where you shop, just ask the butcher about the sourcing of the fish. Even at mainstream grocery stores, they often have an idea. I look for wild caught fish as much as I can, although it’s more expensive. Wild caught is your safest bet. It’s cheaper if it’s been frozen first. Extra virgin olive oil is unrefined, whereas olive oil is refined. Refined olive oil will have a higher smoke point, but it has been processed with heat and chemicals so the flavor and nutrients are not as great as virgin olive oil. 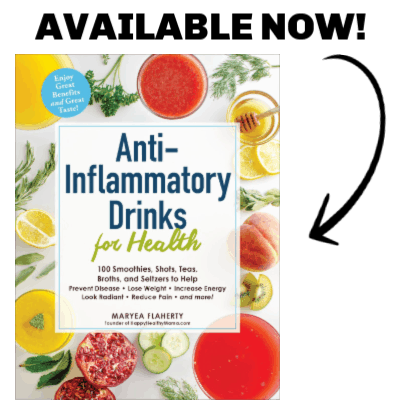 Thanks, Maryea! I’ll ask around our local stores. I have and use avocado oil but historically have always used extra virgin olive oil for roasting veggies in the oven (at 400 degrees) and for cooking frozen veggies on the stove top. Do you think those methods are too high of heat of extra virgin olive oil? Extra virgin olive oil has a smoke point between 320-375, so you should only roast at a lower temperature. For sautéing, virgin olive oil is okay as long as you keep an eye on the stove top and don’t let the pan get too hot. Avocado oil can be refined or virgin as well. The refined oil has the highest smoke point at 500-520 degrees, but you just have to check that the kind you get is naturally refined without harsh chemicals (good brands will say this on the bottle). Virgin avocado oil has a lower smoke point around 400 degrees (still higher than virgin olive oil). Oh, and do you have Kroger where you live? That’s where I’ve been getting my wild salmon and it’s been on sale lately! We don’t have a Kroger locally either, but I wish we did! Thanks for the tips! HOLY YUM! 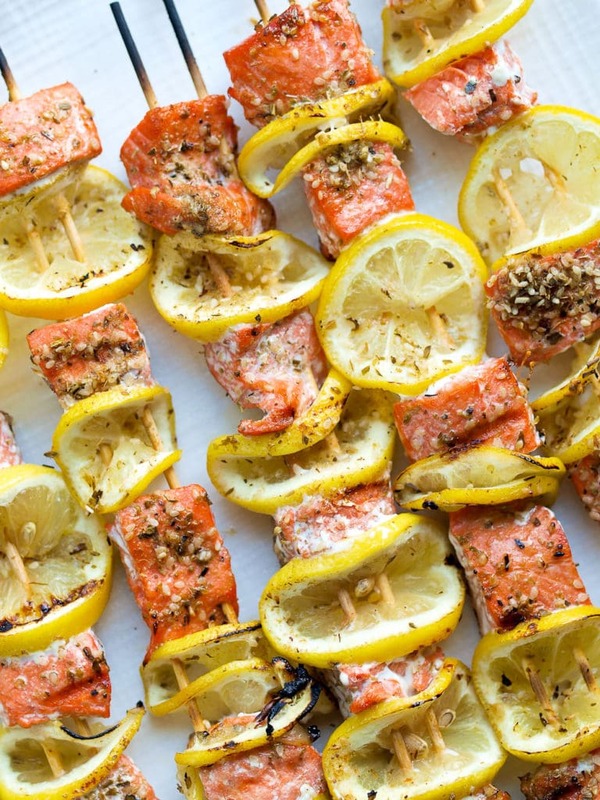 These salmon kabobs look to die for! I LOVE grilled salmon and this is an even funner way to eat it!